The responsible body for data processing on this website is stated in the imprint. This office is the first point of contact for questions relating to data protection. On the one hand, your data is collected by you communicating it yourself. This may involve data that you enter in a contact form or when ordering a newsletter. When you visit our website, your surfing behaviour can be statistically evaluated. This is done primarily with cookies and so-called analysis tools. 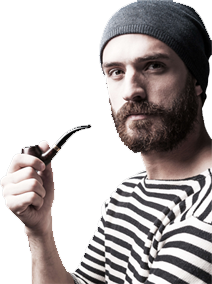 The analysis of your surfing behaviour is anonymous and cannot be traced back to you. You can object to this analysis or prevent it by not using certain tools. You can find details on this in our data protection declaration under the heading "Third party modules and analysis tools". Some of the data is collected to ensure that the website is error-free. With other data, we can statistically analyse your user behaviour on the Internet (e.g. via so-called cookies). Such analyses are anonymous and cannot be traced back to your person. You can object to this analysis. You can find details on this in our data protection declaration under the heading "Third party modules and analysis tools". You have the right at any time and free of charge to obtain information about the origin, recipient and purpose of your stored personal data. You also have the right to demand the correction, blocking or deletion of this data. You can contact us at any time at the address given in the imprint for this as well as for further questions on the subject of personal data. Furthermore, you have the right to appeal to the responsible supervisory authority. Yes, this website uses encryption. This is to prevent unauthorized access to your data. The responsible authority for the data processing on this website results from the imprint. The responsible body is the natural or legal person who alone or together with others decides on the purposes and means of processing personal data (e.g. names, e-mail addresses, etc.). If data processing is carried out on the basis of Art. 6 para. 1 lit. e or f DSGVO, you have the right at any time to object to the processing of personal data concerning you for reasons arising from your particular situation; this also applies to profiling based on these provisions. The respective legal basis on which a processing is based can be found in this data protection declaration. If you lodge an objection, we will no longer process your personal data concerned unless we can prove compelling reasons worthy of protection for the processing which outweigh your interests, rights and freedoms or the processing serves the assertion, exercise or defence of legal claims. If your personal data are processed for the purpose of direct advertising, you have the right to object at any time to the processing of your personal data for the purpose of such advertising; this also applies to profiling insofar as it is connected with such direct advertising. If you object, your personal data will subsequently no longer be used for the purpose of direct advertising. Many data processing operations are only possible with your consent. We will expressly obtain this from you before data processing begins. You can revoke this consent at any time. For this purpose, an informal e-mail notification to us is sufficient. The legality of the data processing operations carried out until the revocation remains unaffected by the revocation. You have the right to have data which we process automatically on the basis of your consent or in fulfilment of a contract handed over to you or to another responsible person in a common, machine-readable format. If you request the direct transfer of the data to another responsible person, this will only be done as far as it is technically feasible. After the conclusion of a contract subject to payment, you are contractually obliged to provide us with your payment data (e.g. account number for direct debit authorisation). This data is required for payment processing. If you do not provide us with this data, we may withdraw from a concluded contract and claim damages from you. If you send us a review together with your picture, your first name, your age and your place of residence (city), we will publish this data on our website with your consent (Art. 6 para. 1 lit. a DSGVO). You can revoke this consent at any time with effect for the future. Please note that we only publish reviews of adult persons (at least 18 years old). Reviews of persons under the age of 18 will not be published and will be deleted immediately. Otherwise, the review data remains with us until you request deletion, revoke your consent or the purpose for data storage no longer applies. Mandatory legal provisions - in particular retention periods - remain unaffected. Cookies, which are necessary for the electronic communication process or for the provision of certain functions desired by you (e.g. shopping basket function), are stored on the basis of Art. 6 para. 1 lit. f DSGVO. The website operator has a justified interest in the technically error-free and optimal presentation of his website - for this the server log files must be recorded. The processing of the data entered in the contact form takes place exclusively on the basis of your consent (Art. 6 para. 1 lit. a DSGVO). You can revoke this consent at any time. For this purpose, an informal e-mail notification to us is sufficient. The legality of the data processing operations carried out until the revocation remains unaffected by the revocation. If you use the Olark live chat on our website, your data from the enquiry form will be stored by us for the purpose of processing the enquiry and in the event of follow-up questions. We do not pass on this data without your consent. The data you enter will remain with us until you request us to delete it, revoke your consent to its storage or the purpose for data storage no longer applies (for example, after your request has been processed). The collected customer data will be deleted after completion of the order or termination of the business relationship, but not before the expiry of the statutory retention periods deleted. We transmit personal data to third parties only if this is necessary in the context of contract processing; for example to the companies entrusted with the delivery of the goods or the credit institution entrusted with the handling of payments. A further transmission of the data does not take place or only if you have expressly agreed to the transmission. Your data will not be passed on to third parties without your express consent, for example for advertising purposes. We use the "Enable IP Anonymization" feature on this website. However, this will cause Google to shorten your IP address in advance within member states of the European Union or in other signatory states to the Agreement on the European Economic Area. Only in exceptional cases is the full IP address transmitted to a Google server in the USA and shortened there. On behalf of the operator of this website, Google will use this information to evaluate your use of the website, to compile reports on website activity and to provide other services related to website activity and Internet usage to the website operator. The IP address transmitted by your browser as part of Google Analytics is not combined with other data from Google. Our Web site uses Facebook, Facebook Inc. 1601 S. California Ave, Palo Alto, CA 94304, USA ("Facebook") visitor action pixel to measure conversion. This allows us to track the behavior of site visitors after they are redirected to the provider's website by clicking on a Facebook ad. This allows the effectiveness of Facebook advertisements to be evaluated for statistical and market research purposes and future advertising measures to be optimized. The data collected is anonymous to us as the operator of this website and we cannot draw any conclusions about the identity of the users. However, the data is stored and processed by Facebook so that a connection to the respective user profile is possible and Facebook can use the data for its own advertising purposes in accordance with the Facebook Data Usage Guidelines (https://www.facebook.com/about/privacy/). This may allow Facebook to serve advertisements on Facebook pages and outside Facebook. This use of data cannot be influenced by us as the site operator. This page uses so-called web fonts provided by Google for the uniform display of fonts. When you access a page, your browser loads the web fonts you need into its browser cache to display text and fonts correctly. For this purpose, the browser you are using must connect to Google's servers. This gives Google knowledge that our website has been accessed via your IP address. The use of Google Web Fonts is in the interest of a uniform and appealing presentation of our online services. This constitutes a legitimate interest within the meaning of Art. 6 para. 1 lit. f DSGVO. This page uses the Google Maps map service via an API. Provider is Google Inc., 1600 Amphitheatre Parkway Mountain View, CA 94043, USA. To use the functions of Google Maps, it is necessary to store your IP address. This information is usually transferred to a Google server in the USA and stored there. The provider of this site has no influence on this data transfer. The use of Google Maps takes place in the interest of an appealing presentation of our online offers and an easy retrievability of the places indicated by us on the website. This constitutes a legitimate interest within the meaning of Art. 6 para. 1 lit. f DSGVO. Our websites use the functions of Google Analytics Remarketing in connection with the cross-device functions of Google AdWords and Google DoubleClick. Provider is Google Inc. 1600 Amphitheatre Parkway Mountain View, CA 94043, USA. This function enables the advertising target groups created with Google Analytics Remarketing to be linked with the cross-device functions of Google AdWords and Google DoubleClick. In this way, interest-related, personalised advertising messages that have been adapted to you depending on your previous usage and surfing behaviour on one terminal (e.g. mobile phone) can also be displayed on another of your terminals (e.g. tablet or PC). In support of this feature, Google Analytics collects Google-authenticated ID´s Google Analytics data from users that is temporarily linked to our Google Analytics data to define and create target audiences for cross-device advertising. The data collected in your Google Account Data is collected solely on the basis of your consent, which you may give or revoke to Google (Art. 6 para. 1 lit. a DSGVO). In the case of data collection processes that are not consolidated in your Google Account (e.g. because you do not have a Google Account or have objected to the consolidation), the data collection is based on Art. 6 para. 1 lit. f DSGVO. The legitimate interest arises from the fact that the website operator has an interest in the anonymous analysis of website visitors for advertising purposes. As part of Google AdWords, we use what is known as conversion tracking. When you click on an ad placed by Google, a cookie is set for conversion tracking. Cookies are small text files that the Internet browser places on the user's computer. These cookies lose their validity after 30 days and do not serve to personally identify the user. If the user visits certain pages of this website and the cookie has not yet expired, Google and we may recognize that the user clicked on the ad and was directed to that page. You can set your browser so that you are informed when cookies are set and only allow cookies in individual cases, accept cookies for specific cases or generally exclude them and activate the automatic deletion of cookies when closing the browser. If cookies are deactivated, the functionality of this website may be restricted. On our website we offer payment via PayPal. 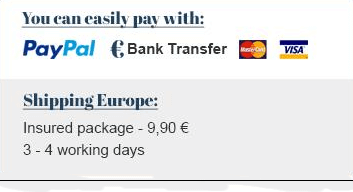 The provider of this payment service is PayPal (Europe) S.à.r.l. et Cie, S.C.A., 22-24 Boulevard Royal, L-2449 Luxembourg (hereinafter "PayPal").